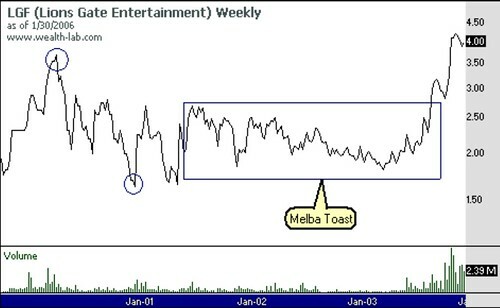 This page will showcase all stocks that I find exhibiting the Essence of Melba Toast. 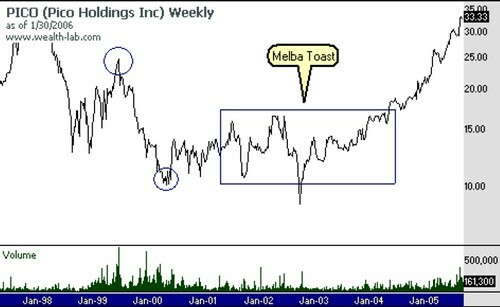 The more examples I can find of Melba Toast...the better chance I have of identifying the logical conditions present in the pattern. So, this page will evolve as new charts are added. 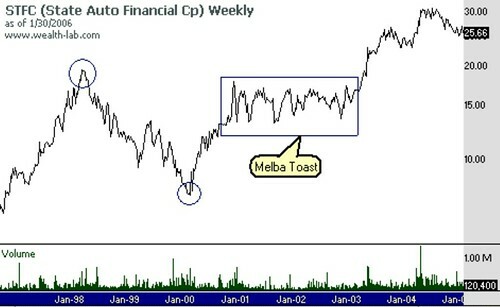 Interested by the Melba Toast phenomenon, I decided to sketch it in Trade-Ideas: Melba Toast. If your account expired let me know otherwise you can still see its configuration and let me know if I got it right. The NR7 alerts that TraderMike assisted in developing might also apply here on a shorter time frame. Hey, that's pretty cool inserting the Melba Toast logic into Trade-Ideas. My account has expired but I'd be more than happy to check out the config for Melba Toast. Just let me know where to look...or email the sketch. Also, Melba Toast's logic is still in the conceptual stage. So, the pattern logic may change a bit.